There are some meals that will be remembered for years to come. 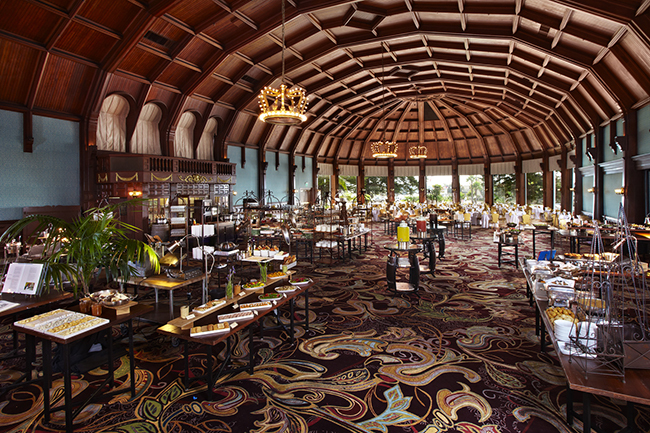 Such is brunch at Hotel del Coronado, beginning the moment one walks into the Crown Room, and beholds an extravagant array of food stations beneath its high ceilings of sugar pine and bedecked with four crown chandeliers. Those light fixtures were designed by Wizard of Oz author L. Frank Baum over a century ago, and I wouldn’t be surprised if Baum, too, enjoyed many a Sunday brunch at the Del. Now, please recognize that when you make a trip to Disneyland, you can’t possibly get to every ride in the Magic Kingdom in one visit. Likewise, when you’re presented with the endless epicurean delights of a Del brunch, you can’t possibly consume every offering. And that’s OK, because it gives you a reason to go back again and again. 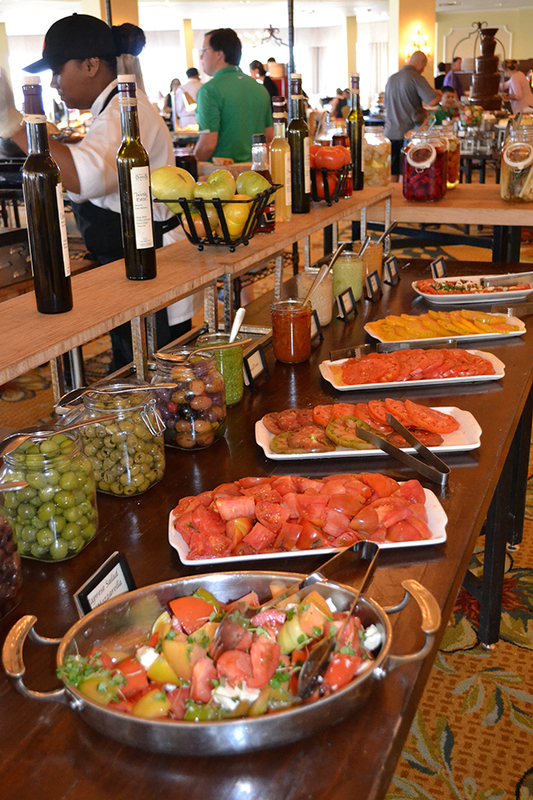 Another reason to brunch at the Del on a more frequent basis is that the chefs are constantly innovating here, always introducing new taste sensations. Besides enjoying the foods, you’re likely to pick up some novel ideas and culinary techniques that you might wish to replicate (as best you can!) at home for special occasions. Aah, the Del’s brunch buffet! It’s one of my favorite ways to dine because it affords the opportunity to enjoy the company of family and friends in an unhurried, comfortable atmosphere. While there is no dress code in place, most people dress up just a bit, because they know this is a special treat. And the fact that you’ll be getting up a few times to visit various food stations encourages chit-chat with your own party as well as other diners, many of whom hail from all parts of the world. It’s easy to see why this brunch is repeatedly named the Best Brunch in San Diego County. Upon arrival, you’ll be greeted by a bevy of friendly wait staff and be escorted to your table. Our waiter then gave us a short tour of the stations, offered us coffee (excellent) and a choice of a Bloody Mary or a mimosa or pomegranate mimosa, with the Hotel Del’s private label sparkling wine. 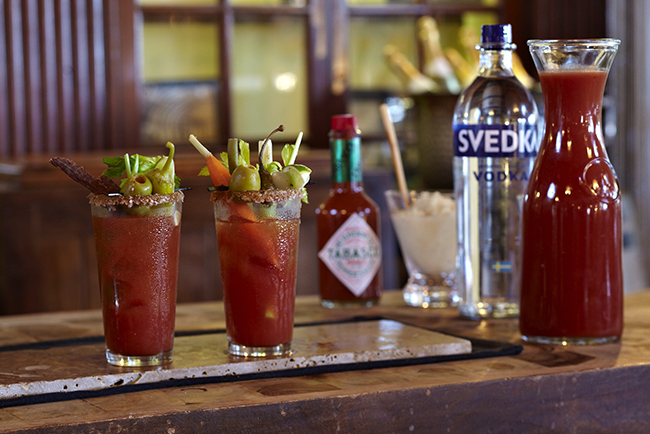 My friend’s Bloody Mary set the tone for the food to come. It featured top-shelf vodka, two plump olives, a giant shrimp and celery stalk. She pronounced it divine. 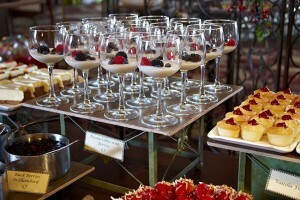 While there’s a mimosa bar, I never visited it because our attentive waiter was quick to offer us seconds (or thirds!). A short visit with Brian Kersey, banquet sous chef, and Julian Quiñones, executive sous chef, provided guidance for navigating the buffet and insights into why the hotel’s buffet is legendary. Off I scooted to the “Café American” station of eggs and griddle fare, with two smiling chefs at the ready for omelets made to order. (Eggs Benedict, scrambled eggs, vanilla-and-bacon soufflé and mushroom soufflés also called out to me; next time!) I topped a waffle with strawberries, whipped cream and flaked coconut, passing up the mixed marinated berries, powdered sugar, warm chocolate sauce, warm caramel sauce, and pecans. I also tried the Del’s delicious homemade granola with honeycombed yogurt but passed on the inviting array of breakfast meats including smoked bacon, chicken Habanera and turkey maple sausage, knowing that a carving station would fill my second plate. But it’s noteworthy that this first station alone offered more than what is found at most brunch buffets. Wait staff, while unobtrusive, are spot on when it comes to refilling coffee cups, offering refills on mimosas and Bloody Marys and surreptitiously removing plates to make way for the new. While one of my dining companions chose crab legs and shrimp from the “Surf” station, I headed for prime rib. Chef Kersey noted that while typical accompaniments for prime rib at most buffets are horseradish and au jus, the Del’s prime rib featured a parsley chimichurri. The smoked turkey came with a freshly made warm cherry glaze and signature white barbecue sauce. There’s also a mint leaf chimichurri sauce folded in with freshly made fig jam. All the smoked meats are smoked onsite, and all the sauces are homemade by the Del chefs, too. At the meat station, guests might want to experience a world of salts, experimenting with tastes of Hawaiian clay salt, black lava salt, Alderwood smoke, fleur de sal or sea salt. I tried another signature dish: the Del’s sherry-braised short rib, which was offered on a small plate atop mashed sweet potato puree with cipollini onion and gremolata, a chopped herb condiment of lemon zest, parsley and garlic. 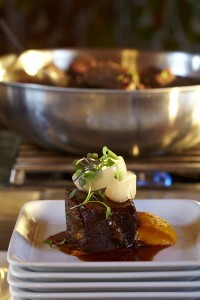 The short rib is slow cooked for five hours then braised in a secret sauce of 15 to 20 ingredients. My meat didn’t require a knife; it fell apart in my mouth. There were potato casseroles and salads too numerous to mention, but I must comment on the boeuf bourguignon: it would have made Julia Child take note as it was packed with deep rich flavors of beef melded with onions and mushrooms. At a cheese station I sampled drunken goat cheese with blueberries, Gruyere and Stilton cheeses, Manchego cheese from Spain, Point Reyes cheese and smoked Gouda, pairing the various cheeses with mixed nuts, pistachios, figs and chutney. At the tomato station, I surveyed a variety of heirloom tomatoes and chose one dish that paired them with fresh mozzarella. There was also a variety of olive oils and balsamic vinegar accompaniments. 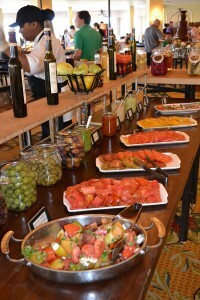 A recent addition is the ceviche bar, one of the results of the Del’s collaborative meetings of its culinary staff that encompass all Del food operations. Desserts are also in abundance and fun-filled, such as the cupcake bar where guests can design the tops of their red velvet or carrot-cake cupcakes. The chocolate fountain station featured fruits and marshmallows for dipping. There were countless mousses and cheesecakes, cherries with Burgundy sauce and blackberries with Chambord. But my favorite was the French macaroon cookies, sandwiched with rich raspberry mascarpone. The Del brunch includes up to three hours of validated parking (normally it’s $26 for the first two hours). But here’s an idea for locals: this might be a perfect occasion to walk to the Del and back! 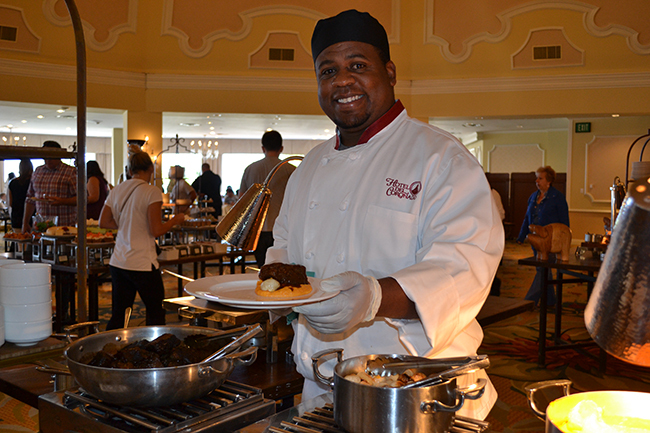 Offered 9:30 a.m.-1:30 p.m. each Sunday, the Del brunch is $85 for adults; $24.50 for children 6-12; children 5 and under eat for free; tax and gratuity are extra. Lunch has been served in the Crown Room at the Hotel del Coronado for over a century. Chefs man eight of the 12 buffet station at the Hotel del Coronado brunch. 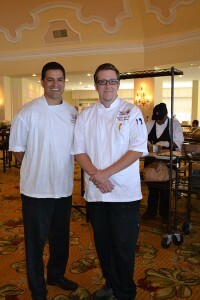 Julian Quiñones, executive sous chef (left) and Brian Kersey, banquet sous chef. 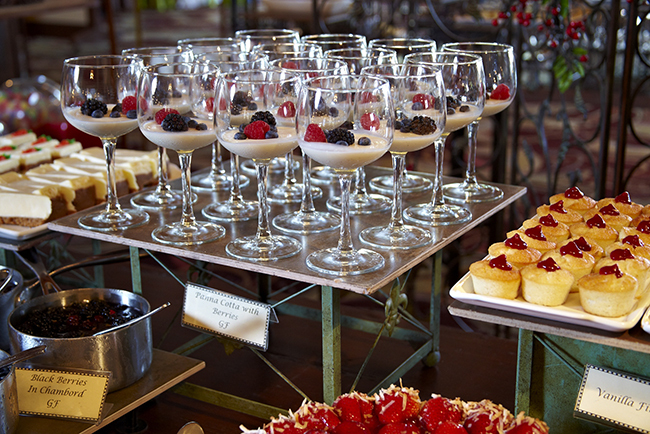 Desserts abound at the Hotel del Sunday brunch.